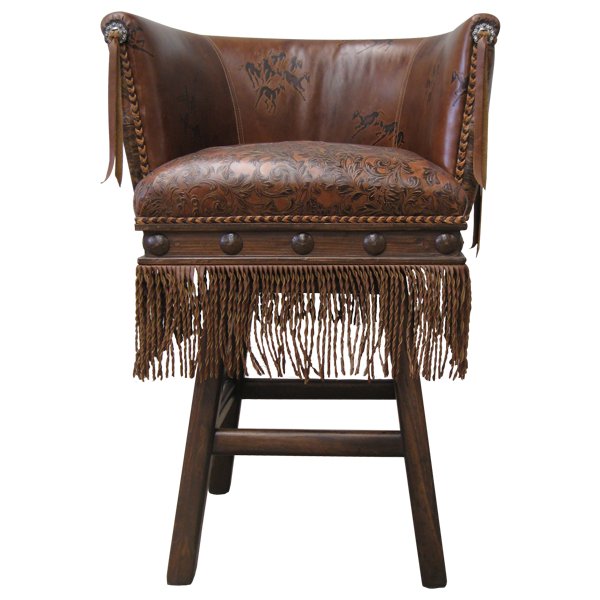 This very sophisticated Western style custom bar stool is full of intricate and remarkable handcrafted details. 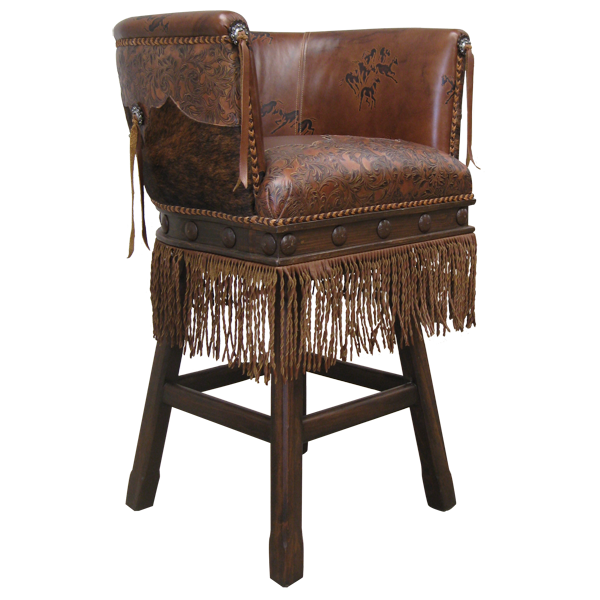 If you are interested in class with a Western legacy, this bar stool is perfect for you. The seat of the bar stool is upholstered with exquisite highly embossed full grain leather, and the inside seat back is upholstered with two contrasting colors of rich dark full grain leather. The reverse seat back is upholstered with the same two contrasting rich dark full grain leathers, but in a Western cut design. The Western influence is further reflected in the dramatic long dark full grain leather fringe hand tacked around all sides of the base. A full grain leather hand braid is also attached to and goes around the entire main body junction of the bar stool. Also, four hand forged copper slotted conchos with a latigo made of full grain leather fringe are incorporated into the bar stool; one on each side of the stool, and one in each hand rest. The bar stool is further decorated with hand forged iron conchos around its entire lower body. Made with the best wood available, the bar stool is both durable and comfortable. The bar stool swivels 180° and is 100% customizable.